The Chicago & Eastern Illinois Railroad operated fast freight and passenger trains from its Chicago hub down to Evansville, IN. It was later split in two with the L&N and the MoPac getting half each. The Chicago & Eastern Illinois Railroad is represented here by a new EMD E7 passenger diesel in charge of The Zipper fast passenger train. 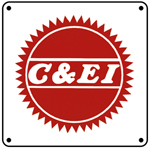 Unique Zipper and C&EI logos included. 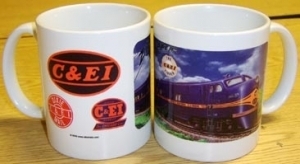 The Chicago & Eastern Illinois Railroad is represented here by the logo and paint scheme used on their diesel locomotives.